MASALA: A mixture of ground spices,( Comm; A bit of everything). This Malaysia small group tour is ideal for both the first time Asian traveller and the Asian travel addict. 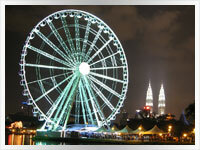 We believe this is the best tour vacation package to experience Malaysia today. If you want an easy introduction to the region then Malaysia would be the best choice. Welcoming, Safe, hassle free and with food unrivalled anywhere else on earth. Malaysia has it all but is still as Asian as it gets. As Malaysia heads towards a developed nation it now has most of the mod cons of the west but thankfully it hasn’t lost its cultures of the past, and that’s what this trip is about. While you can visit the Petronas Twin Towers and/or the K.L. Tower and use the new light rail system in K.L. that’s taken the hard work out of seeing the capital it’s the historic cities of Melaka, Georgetown, Kuala Kangsar and Taiping that will enthral you. Add to these the lesser-known island of Pangkor and the scenic Cameron Highlands with a chance to cool down in the hill station town of Tanah Rata and you will see that Masala is the perfect description. Food is no doubt a major highlight of this trip. Baktraxs’ food advisor from France declares without hesitation that, “Malaysia is undoubtedly the food capital of the world”, and Georgetown, Penang is the best place in Malaysia to try a lot of it. Baktrax takes no responsibility whatsoever for gained weight during this trip. Whether it’s Indian Masala Dosai or roti, Chinese dim sum or Malay nasi lemak or Laksa, this trip has it all. Baked beans on toast can even be found occasionally. For lunch & dinner, you’ll have to come and do this trip yourself to find out more. Once you visit Malaysia you will only want to return again and again as it is possibly the most addictive country in the world for both food and even more so for the atmosphere among all the friendly faces. ACCOMMODATION = (4 star hotel x 3 nights, 3 star hotels x 6 nights, 2 star hotels x 11 nights). BANGKOK - PENANG - TAIPING - KUALA KANGSAR - CAMERON HIGHLANDS, (Tanah Rata) - PANGKOR ISLAND - MELAKA - KUALA LUMPUR, (K.L.). Four-star hotel, ( 3 nights). Tour of Cameron Highlands, (half day). Tour of Penang Island, (full day). 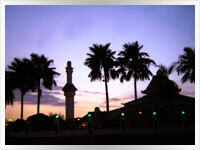 Use of a taxi to see the sights of Kuala Kangsar, (half day). 19 meals included as per itinerary. Tonight our Malaysia Masala best tour package will stay in; BANGKOK - Our Malaysia group tour officially starts when you check into our Bangkok accommodation. A welcoming dinner will be had in the evening. D.
If you arrive early your free time could be spent visiting the enormous Chatuchak weekend market and/or, Wat Phra Kaew & the Grand Palace, Wat Pho, Wat Arun, MBK or Siam shopping centres or have a local experience boat ride with the locals on the Chao Phraya express to some local shops & markets in Nonthaburi. A few of the dozens of other options could be Vimanmek Teak Mansion, Chinatown, Wat Traimit, Jim Thompsons House, Silom or Sukhumvit road shops. OR? Maybe just lay back poolside and have a famous Thai Massage. A month in the capital wouldn't be enough time to see it all. BANGKOK - A free day to get the feel of this amazing city. Our tour coordinator will be more than happy to make suggestions on what to see or do as well as pointing you in the right direction when you decide which way to go. As it's a Sunday the Chatuchak Weekend Market is a popular place to go. With thousands of stalls don't expect to see it all in one day but do expect to buy something you never even knew existed before today. From a mouse to an elephant; Although it's so big even an elephant may be hard to find. One of the worlds great markets. Bartering, (always with a smile), is the name of the game as usual. B.
Tonight our Malaysia small group travel tour will stay on; PENANG - Our small group will take a short international flight to Penang and on arrival transfer to Georgetown the big and busy capital of Penang Island. Georgetown has an atmosphere unlike any other place known to Baktrax in Malaysia and possibly all of S.E. Asia. It's our all-time favourite destination. Go back in time as you walk the fascinating streets of the state capital. Fort Cornwallis, Penang Museum, Khoo Kongsi Chinese Clan House, Cheong Fatt Tze Mansion. Then maybe, Acheen Street Mosque or Hainan Temple and dozens of more mosques, temples and colonial buildings or head up to Penang Hill at 800 metres and get some great views of the island. Do this either by a long hard walk or take the historical Funicular Train where a monkey or two is often seen scampering around the tracks. Lastly, but not the least, maybe a budget visit to a local dentist to offset some of your holiday expenses. B.
PENANG ISLAND - A full days island tour is included today. But without doubt, the chief reason for coming to Penang is the FOOD! Your accommodation is within a few minutes walk of a multitude of Malay, Chinese or Indian restaurants. Two minutes away from our hotel Jaya Indian restaurant. (open 24 hours), is just one great starting point. Pass up the included hotel breakfast and invest in a full on Jaya Indian breakfast experience at least once is our advice. All for less than $5.00. Penang's Curry Laksa or Indian Tandoori chicken with Garlic Nan bread is just but 2 of the better known local favs. If there is one downside to all this food, it is that the choices will totally confuse first time visitors. Your tour coordinator will be invaluable at meal time. This will also be your first of many chances to eat the local way with a Banana Leaf Meal and it doesn't get much better than a bottomless vegetarian one at Krishna Villa restaurant in the heart of Little India. B.
PENANG ISLAND - Now that you realise why so many visitors rave about Penang you have a free day for more exploration and/or shopping. AND! FOOD! FOOD! FOOD! China Town, Little India or the modern shopping malls of Komtar, Prangin or the even more upmarket Gurney Plaza will keep you busy today. Nearby Penang road market stalls will be the place for any souvenirs and an Ice Kachang to cool you down along the way. B.
Tonight our Malaysia best tour package will stay in; TAIPING - A short bus trip today will see our group tour in the lesser known but no less the historical town of Taiping. Taiping is small enough to walk around and take in the relaxed feel of the colonial era buildings of which most are well over a century old. Taiping also has a 62 hectare lake gardens which includes one of the best zoos in the country. www.zootaiping.gov.my; The zoo opens in the evening also for a night safari. B.
TAIPING - A free day to explore Taiping. Just a few of the sights include; The District office, All Saints church, Old Kota Mosque, Train Station and the Chinese Ling Nam Temple. Most of the attractions are circa the 1880s. B.
Tonight our Malaysia small group tour will stay in; KUALA KANGSAR - Another short bus trip today will see our small group tour in the royal town of Kuala Kangsar. A truly Malay small town which was theoriginal home of the Malaysian rubber industry. showing the history of the Perak Royal Family. take you around the sights in the afternoon. B.
Tonight our Malaysia best small group travel tour will stay in; TANAH RATA - A chance to cool down for a while as our small group tour heads by bus to the hill station town of Tanah Rata, the main town in the Cameron Highlands. At 1800 metres above sea level it's blankets year round at night with cooler but not cold days most of the year. Some of the attractions include the Tea Estates. Sam Poh Temple and the Sri Tehnadayuthapany Swamy Temple. But with the cooler climate, one of the major pass times for visitors is hiking along the scenic mountain trails of which there are numerous marked ones. Once again another foodies delight awaits in Tanah Rata with some of the best South Indian restaurants in Malaysia. Just one worth a mention is Bunga Suria with their food just about as good as it gets. Lots of Arts and Craft shops nearby to tempt you along the single main road also. No meals. TANAH RATA - Check out the enviromental awareness in the highlands at www.reach.org.my before either a morning or afternoon half day tour of the region today. The tour includes a visit to the Boh Tea Estate; www.boh.com.my; a Chinese temple and a butterfly farm while all the time enjoying the great scenery as you go. B.
TANAH RATA - With lots of walks and other exploation to do in the cooler air there's no excuse for just sitting around and trying the sensational food. You can still do that after working up an appetite. An optional Agro Delight tour maybe? Or visit a honey bee farm for a look at a working apiary. It doesn't get any more laid back in Malaysia than Tanah Rata. B.
Tonight our Malaysia small group holiday tour will stay on; PANGKOR ISLAND - Our group tour will have a long travel day by bus and boat today and be rewarded with the lesser known but no less attractive island of Pangkor for three nights seaside. Apart from the beaches and scenery, there are a few interesting Chinese temples such as Lin Je Kong, Foo Lin Kong or a Hindu Temple. Kota Belanda (Dutch fort, circa 1670), is worth a look also. Hire a motorbike or bicycle and do a lap of the island which is only 20 kilometres around. No meals. PANGKOR ISLAND - We are now in true tropical island holiday mode so either relax on the beach or go for a stroll on this small but beautiful island. B.
PANGKOR ISLAND - Another day on a beautiful tropical island. SOMEONE HAS TO DO IT! B.
Tonight our Malaysia small group tour package will stay in; MELAKA - An early start for the long bus ride today from Lumut will have our small group tour in the UNESCO World Heritage City of Melaka. Along with Penang, Melaka has one of the richest histories in all of Malaysia. Start at Melaka's most well known pink landmark of Stadthuys (Town Square) in the historic town centre which may be the oldest Dutch building in the East. A large number of museums in the area include the Islamic, Architecture, Peoples, History & Ethnography and Literature Museum among others. Then maybe, St Paul's Church, 8 Hereen St, which is a Heritage trust of Malaysia restored Dutch Era residential house, Cheng Hoon Teng Temple (circa 1646), which is still in use today by the local Buddhist community or the oldest functioning mosque in Malaysia of Masjid Kampung Hulu, (circa 1728). Melaka has far too many attractions to list here. Nonya food is one of the different styles more famous in Melaka but you will find a plethora of others, both local and international. Between seeing and eating you can browse at the many shops along the famous Jonkers street now called Jalan Hang Jebat or at the modern shopping mall of Dataran Pahlawan. No meals. MELAKA - A free day to explore all of the above which is centred around today's Chinatown. Maybe a stroll beside the river to little India for another Banana Leaf meal? A short but interesting riverboat tour is another option also. B.
Tonight our Malaysia best tour package will stay in; KUALA LUMPUR - A shorter bus ride today will see our small group tour in the Malaysian capital of Kuala Lumpur. Better known to all as K.L. A bit like another version of Bangkok is K.L. Hectic & bustling although more compact with loads to see and do. The Petronas Twin Towers is the must-see for many. For an even higher view of the city try the 421 meters high Menara KL (KL Tower) built on top of Bukit Manas Forest Reserve. Then in no particular order may be the colonial architecture Kuala Lumpur Train Station, Merdeka Square, Masjid Negara (National Mosque), Masjid Jamek (Friday Mosque). A stroll around the Central Market or Lake gardens possibly where the K.L. bird Park; www.klbirpark.com is the worlds largest walk-in aviary with almost 200 species of birds. But just like Bangkok; A month wouldn't allow enough time to see all the sights or try all the different food. B.
KUALA LUMPUR - A totally free day to explore K.L. The city centre is reasonably compact which makes for an interesting stroll in itself. B. But the biggest decision today will again be where to sup as the multitude of restaurant choices outside the hotel door in the middle of Chinatown is indeed bewildering for locals & newcomers alike. Maybe the cheapest will be the best with the locals at the economic local food buffet for less than $5.00, with a cold beer almost immediately on offer as you sit down. It doesn't get any more atmospheric with the sublime back ground music. This slightly surreal experience may even be the trip highlight for some. Nearby Petaling street in Chinatown has a multitude of street vendors. Tonight our Malaysia best tour package will stay in; BANGKOK - A short international flight will see our group tour back where we began. The Big Mango, Krung Thep, (City of Angels), or just Bangkok. B.
BANGKOK - A final full day in Bangkok will allow time for some more exploration. Last minute shopping, sightseeing or a day trip are among the myriad of options for your last day in the city of Angels known as Krungthep to the locals. Our Malaysia best tour package is officially over when we check out of our Bangkok accommodation. An airport transfer is included as always. B. You have just experienced a great cross-section of the best of Malaysia. Are you now addicted like most of us to want to return again and again? It really doesn't get any easier or better for an introduction to and/or a true Asian travel experience than Malaysia. P/P,T/S; land only; Included are two international flights from Bangkok to Penang and from K.L. to Bangkok.